Well I’m home now which means I left Australia on my long journey home to Portland. By long, I mean a very long flight of sitting on a plane with the seatbelt sign on. It was on pretty much 10 of the 14 hour flight. My last full day in Sydney consisted of walking over the bridge and riding around on the ferries. It wasn’t the best weather to walk over the bridge but at least I wasn’t on top of the bridge doing the bridge walk for a huge amount of money. I began to wonder how many photos I could take of the bridge or opera house. Turns out I still have a lot of photos with both of those items. There were a lot of sailboats out on Saturday and how could I not photograph the boats with the opera house? Then on the day we left there was a triathlon in the harbor with the opera house in the background. 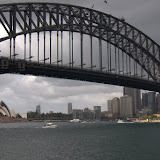 Needless to say, I can find a thousand ways to photograph the opera house and bridge. I’m still amazed at how many bats Sydney has. They are so loud even in the middle of the day. I think it is funny that there is a cafe located right below all the bats. I ate breakfast there the day we left and it was kind of stressful to listen to. They don’t fly low so they really aren’t bad to be around but they do stress you out. I guess they call them flying foxes in Australia. Australia is a special and beautiful country. I’m already looking forward to going back someday. I won’t lie…I already looked up flights back. Just have to wait for my travel budget to grow again. I haven’t ever taken night photos but I decided to give it a go. 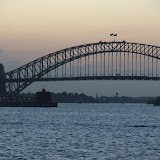 The following is a slideshow of dusk or night photos of Sydney. Most are of the opera house or the bridge but I think some look pretty good. One of the must to go places in Sydney is Manly Beach. It is a nice beach area especially for surfers. We spent the entire day out there either sitting at the beach or walking around. No swimming for me since I didn’t have a towel with me but the water did look nice. I was a little surprised though that the water wasn’t warmer. I hope if I ever take up surfing that they let me join the little kids lesson. The little kids were so excited to get out in the water with their board and ride the waves. Of course they weren’t standing yet but I’m sure they will in no time. Never thought I would spend a lot of my trip at animal parks but yet again here I am at the aquarium and Ocean World. I would have to say that I have seen some of the strangest sea creatures. There are fishes that look like rocks and other ones that look like weeds. What a crazy world it is under the ocean. 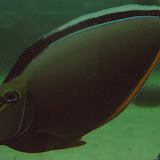 Ocean World is located on Manly Beach just a short ferry ride away. Ocean World isn’t worth the trip by itself. We were more going over there for the beach but thought we would pop in there to see what they had. 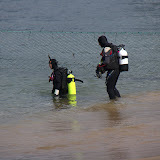 It was a small exhibit but we did see the feeding of the sharks and turtles by the divers. They only feed them 3 days a week at 11:00 and we just happen to be walking through exactly at that time. Pretty lucky timing I guess. The tank was pretty dirty since they were eating so the photos are hard to see but you can get the idea. Well since we didn’t see any kangaroos out in the wild we had to pay money to go see a kangaroo. Since the weather was a bit rainy we decided to go for the pass that includes the wildlife park, aquarium and ocean world. The wildlife park contained butterflies, snakes, bees, koalas, crocodile (one of the world’s largest) and of course kangaroo. The crocodile was still when we first walked up to the exhibit but then it decided to go for a little swim. It seemed so effortless for this very large croc to move. It was pretty fun to watch it swim around in a circle. The kangaroos were probably my highlight of the park. We just missed the time where we could have our photo taken with the kangaroo but that was okay. I just enjoyed being right next to them in the exhibit. They can come right up to you (although they mainly just stay away). There were no females so I didn’t get to see a baby kangaroo in any pouches. There are a couple of photos of Lego exhibits in there. They had some of the largest Lego exhibits I have ever seen including entire walls. Not sure why I didn’t try to become a Lego designer. I wasn’t sure what to think Sydney would be like before arriving. Would it be a large city that just doesn’t have charm or would it be a city that just captures your eye? Sydney is by far one of the greatest large cities I have ever been to. Even though I’m staying in the central business district in a business hotel, I just feel at home in this city. They have great running paths and a huge botanical garden right next to the opera house. Of course everybody knows the famous opera house. Hard to believe that I have been standing right in front of it when usually it is just an icon that is on TV on New Years. I never did know that Sydney has thousands of bats. Yes, that is right bats. 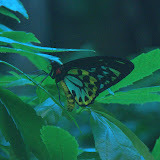 They live in the botanical gardens and make a lot of noise as they start to wake up. If you love bats then walk around the gardens around dusk. I on the other hand do not like bats but was also dumb enough to be walking through the park at night. Between the cockatoos and the bats, it was a flying creature nightmare for me. I think Sydney is a lot like New York. It can offer something for everybody. Kids would love all the animal parks and beaches, adults would love the shopping and nightlife. I love all of it including the animal parks. 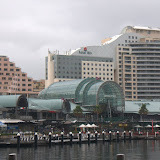 Sydney seems like a great city to meet people and be out and about. The slideshow contains photos of the city and the botanical gardens (including a photo of the bats in the trees). Our plane didn’t leave Tassie until 5 so we had pretty much all day to explore. We walked around Hobart around sunrise and then we sat outside and had breakfast. The city is very cute and charming. We then drove to the Tasman Peninsula. The Tasman Peninsula is famous for the penal colony in Port Arthur. We didn’t have time to actually walk around the colony but we did see some of the sites around the area. 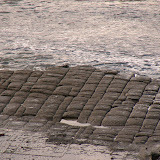 One that really stuck out was the tessellated pavement. The stones were perfectly created by the ocean and the salt. How close the stones are to the water determined how the shape was formed. The closer to the water the stones were more like loafs and further away from the water the shape was like a pan. If you ever have a chance to visit Tassie then you really need to visit the tessellated pavement. It is a very rare feature that is worth some time. The photo slideshow are photos from around the Tasman Peninsula including the tessellated pavement and some of the beautiful cliffs around the area.